New details have emerged about "self-cleaning" effects in the Gulf of Mexico witnessed in the wake of the Deepwater Horizon oil spill. Researchers reporting at the American Chemical Society conference revealed details of a cascade of micro-organisms that spring into action to degrade oil. Research has also outlined how chemical "dispersants" used in clean-up efforts actually frustrate these processes. However, the long-term effects of the weeks of oil exposure remain unknown. And concern was expressed about the ultimate resilience of the Gulf. Terry Hazen of the University of Tennessee, Knoxville, has been studying oil-degrading microbes in greater and greater detail since the disaster, even discovering some that had never been seen before. They can break down the long-chain carbon-based "alkane" molecules present in oil - and in isolated conditions will even move towards oil. "They're really oil-seeking missiles," he told the meeting. In a sense, it is no surprise that the seas should host oil-hungry microbes; natural seeps from the ocean floor have been releasing oil into the world's waters for millions of years. A 2003 US National Academy of Sciences report put the annual average of this seepage in the Gulf at 140,000 tonnes. But Prof Hazen's research has revealed more of the complex web of microbes that feed on oil - and are in turn fed on. Through recent studies, most recently in Frontiers of Microbiology, he and collaborators have begun to map the genomes of these microbes and determine which genes contribute to oil-degrading properties when oil concentrations rise. A release like that of Deepwater Horizon contains a rich mix of carbon-containing molecules - alkanes, methane and what are called polycyclic aromatic hydrocarbons (PAHs), each presenting its own risks to the environment. The new finding is about methanotrophs, which feed on methane - among the last compounds to be degraded. Prof Hazen said that the sudden release of methane, rather than slow seeps, created a lucky effect. "All of a sudden the [methanotroph populations] go up to really high densities and they're fat and happy - and then [the methane is] gone." he told BBC News. "At that point, they degrade anything else that's there fortuitously, and they'll degrade it down below what would be usable as a carbon and energy source - so it's really sort of a 'deep-cleaning' effect. "That's why I think the Gulf of Mexico is cleaner than you would expect, not only from the oil but from everything else that goes into it." Back on shore, Gabriel Kasozi, now of the Makerere University of Kampala in Uganda, studied the sediments in coastal areas of Louisiana after the disaster. "We took samples 3m and 15m from the shores… followed that for about a year and did some modelling. We found that the half-life of the half-lives of the alkanes was about 70 days and PAHs was 100 days," he told the meeting. "After a year, the concentrations had pretty much reduced to background levels." What is becoming clearer with time is that the chemical dispersants typically used in clean-up efforts to break masses of oil up into small droplets does more harm than good. 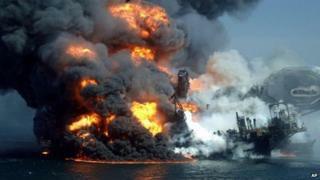 A 2011 study in Aquatic Microbial Biology showed that the dispersant used during the Deepwater Horizon cleanup was harmful to several oil-degrading bacteria - in lab conditions wiping one species out completely. But Dongye Zhao from Auburn University in the US said that the dispersants also caused sediments to absorb more of the harmful compounds, lengthening their effects on the environment. "Preliminary results show us that adding dispersants induces a series of hystereses," he told the meeting. "That means it's really going to… increase absorption, which is quite counterintuitive." The group's work presented here also showed that dispersants interfered with other natural processes that degrade oil, including effects from sunlight and ground-level ozone. Prof Hazen said that while the Gulf was cleaner, faster than was once assumed, the effects of spills are yet to be fully quantified. "There was a lot of oil out there for 84 days," he told BBC News. "Fish and bacteria and plankton and everything else were swimming through that oil, and we don't know what long-term effects that'll have. "I am quite worried about how resilient the Gulf of Mexico is," Prof Hazen said. "She's had some pretty dramatic traumas, and I'm worried how much the ecosystem can actually tolerate."